Let’s start off with the shortest part of all this: the compliments. This installment of the story does at least include some good development of Rocket’s character. The side story of his departed in-lab love interest is a nice background tale that gives his softer side a chance to show. Another commendable factor were the multiple decent attempts at action sequences. Despite the clunky interface and its resulting inconsistent results, the action played more genuinely in this episode. Probably because it was more space-battle and less sloppy-Matrix-time-freeze hand-to-hand snoozer than the first episode’s showdown with Thanos. That’s about it for the redeemable traits of this general “meh” of a title. The rest of this review will get old fast for those who already know my opinion of most of the Telltale platform. 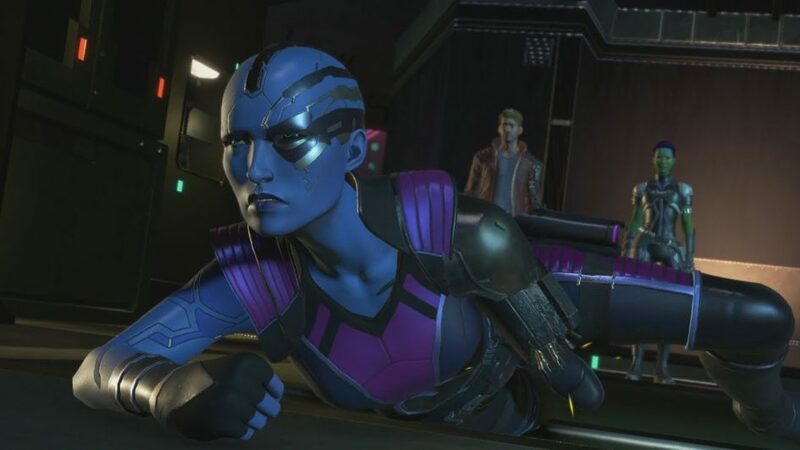 I will be brief in this, but the largest offending factor for this particular game is the fact that all the worst traits of Telltale games are exaggerated by Guardians. The game is comprised of unapologetically robotic animation and ugly character designs. More than other titles, this rendition features a particularly tedious and plodding gameplay mechanic that hasn’t let up since the first episode. The forced step-by-step milestones of already-obvious puzzles continues to insult the intelligence of the player. The music is a mixed bag, too, with the general song selection being nicely in-step with the overall franchise, but that glaring omission of “Under Pressure” never fails to cause major disappointment any time a song is imminent and turns out to be some other tune. The music element is a great jumping-off point for the largest and most inexplicable drawback which plagues the game: lack of connection to the film franchise. Despite having lifted various look-and-feel elements from the movies, and having retained the movie-added Walkman element to Peter Quill, these stories seem to unfold as a hodgepodge hybrid of both comics and film background. It almost feels more like a cheap knockoff of the real thing, and it weighs down the experience. By contrast, the Michonne edition of Telltale’s Walking Dead game succeeded greatly in licensing a major character and keeping the spirit of the on-screen material as well as the page. For Guardians, it was just a dumb choice to lean on one-off comic-borne material and not spin off from the movies directly, but adopt so many cherry-picked film elements along the way. Maybe I’m just an old man about this. Maybe these types of games just need to “get off my lawn.” Or maybe the game market has allowed Telltale to get too much traction with phoned-in money pit game editions. I don’t know, but I do know this is not a title that keeps me awake most of the time, much less enthusiastic.